Tonight's gig was one I'd been looking forward to for months, having bought a ticket on the day they went on sale. Tours with one great band are common, tours with two great bands are less common, but tours with three great bands are rare. Tonight promised to be a fantastic night packed full of hits. Next up were Europe, fronted by one of rock's best frontmen, Joey Tempest. Their long career has seen their sound change several times, and tonight's set includes a mix of material from their career, from their 80s hair metal heights to the more blues-rock material off the "Bag of bones album". They kick off their set with two songs from the "Bag of Bones" album before taking us back to the 80s with "Superstitious". 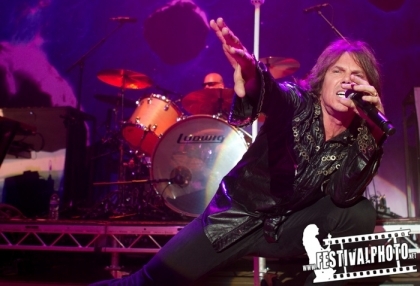 The band put in a flawless performance, but it's Joey Tempest's performance that steals the show as he swings his microphone stand around, leans back so far that most people half his age would struggle to stand up again, races around the stage and gets the crowd involved. After a fantastic set they leave the stage before returning to do an encore. They kicked off the encore with "Last look at Eden" before ending with their biggest hit, and a song that fans would be disappointed not to hear - "The final countdown". During "The Final Countdown" they got a shock as Foreigners bass player Jeff Pilson ran on stage wearing just a T-shirt, boxer shorts, and a cape, and then proceeded to dance around - last night of the tour high-jinks. Even with a surprise like that, Joey and the band carried on with a great performance. After a set that good, I was curious to see how Foreigner could possibly follow it. After a short break it was time for tonight's headliner, Foreigner. With something like 75 million records sold over their career they've got plenty of hits to choose from, and right from the opening song "Double vision" they deliver a set packed with hits. 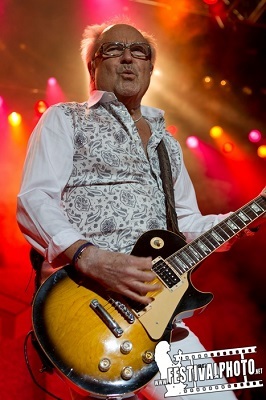 During the first few songs there was a noticeable absence - founding member and lead guitarist Mick Jones was missing. He only joined the band on stage later, but even before he came out the band were going down a storm - but then again with a stream of hit songs, a great band and an excellent singer then it's hardly a surprise. Kelly Hansen is a great frontman as well as a great singer. During "Cold as Ice" he jumped down off the stage and climbed up onto the barrier where he got up close and personal with the fans as he sang, before getting back on stage before the end of the song. This was definitely one of those shows where you don't want it to end, but sadly after Jukebox hero they ended and left the stage before returning for the inevitable encore. I was slightly surprised by the order of the encore - they ended with "Hotblooded" which although it's a great song, isn't quite as popular as "I want to know what love is", but it could just be that they wanted to end with a rockier song. An excellent performance by the whole band as they gave us hit after hit - what more could you ask for? All three bands were first rate tonight, and I doubt there was a single disappointed fan in the audience. Hopefully we'll get new albums from some of the bands before too long and then maybe more individual tours.